Stock # (US) #4227/4040 Asst. Hasbro package contents listing Includes: culottes, top, socks and shoes. Skip here for a listing of other depictions of How You Play The Game (cartoon, prototypes, catalogues, etc). 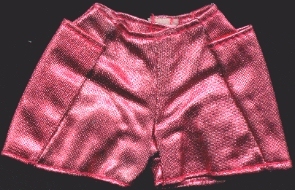 culottes: Dark pink lamé with large side pockets, velcro closure. top: crisp cotton with linear squiggle multi-coloured design, top from sleeve tip to sleeve tip is trimmed with dark pink sequins. Totally opens in back, velcro. socks: Pale aqua spandex with hot pink sequins. They aren't identical, there mirror each other. There is no pattern on them, it was caused by scanning. 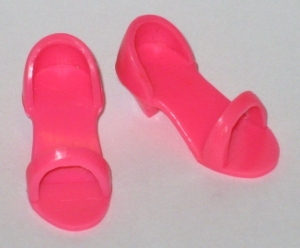 shoes: Hot pink open toed heeled sandals. My Canadian (NRFB) version of this outfit came with sandals the same shade as those from Set your Sails. Packaging Variants: A listing of the packaging that How You Play The Game can be found in, that I know of, so far! Canadian Issue: 1987 photograph On Stage Fashions card. 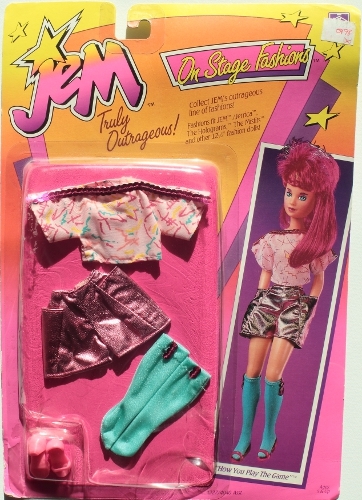 The same photo (see top of page) is used for the 1987 US Hasbro Toy Fair Catalogue, the 1987 France/UK Toy Fair Catalogue, the Second Year Jem Catalogue Poster and the Second Year package art -the socks look darker in the photos than the produced version, squiggles look less bold than the produced fashion. It is one of the outfits featured in the Rock Backstager and Rock N' Curl Jem commercials. It may be in other commercials I haven't yet screen captured for this site. Credits: Socks scan courtesy of Rhonda Robinson. Thanks to Glamour to Divaz for letting me photograph the sandals.